First Wednesday’s July Salon will be held on July 6th, 2011. Photographers Patrick Nagatani and David Hyams will present work beginning at 6:30pm, followed by a book signing by Nagatani and exhibit preview of Axle Contemporary’s photography exhibition Reprocessed Photography in the Physical World. David Hyams will be present his recent work – contemporary portraits utilizing the wet-plate collodion process. Nagatani will be discussing his prolific photographic career and book Desire for Magic published by University of New Mexico Art Museum.. 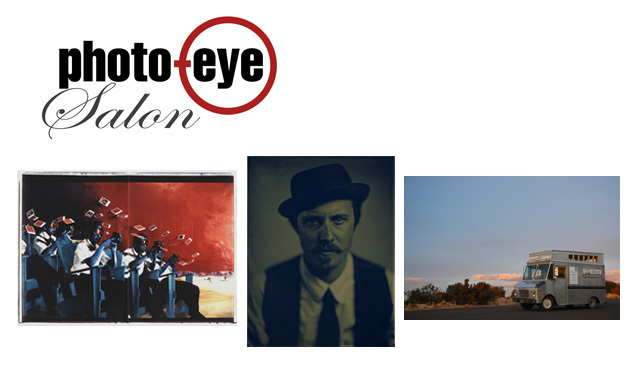 In addition to the Salon and book signing, Axle Contemporary (mobile gallery) will be parked outside of photo-eye Gallery for a preview of their new exhibition, Reprocessed Photography in the Physical World, which opens Friday July 8th, 5-8 pm in front of SITE Santa Fe, 1606 Paseo de Peralta. The show includes work by Patrick Nagatani, Matthew Chase-Daniel, Key Sanders, Jetsonorama, Jay Etkin, Guy Cross and Marion Wasserman. Patrick Nagatani is a professor emeritus in the Department of Art & Art History at the University of New Mexico. A major survey of his work from 1978-2008 opened at the UNM University Art Museum in the fall of 2010 and is currently traveling. The companion book, Desire for Magic, was recently published by the University of New Mexico Art Museum. In 1991 he earned the Outstanding Faculty Award from the College of Fine Arts and from 1998 to 2000 he was honored with a Regent's Professorship. In 2004 he was recognized for his scholarly achievements and exemplary contributions to the College of Fine Arts by the University of New Mexico Libraries. Nagatani received his M.F.A. degree from the University of California, Los Angeles in 1979. He is a recipient of two major National Endowment for the Arts Visual Artist Fellowships. Some of his awards include: The Aaron Siskind Foundation Individual Photographer's Fellowship, The Kraszna-Krausz Award for his book Nuclear Enchantment, the Leopold Godowsky Jr. Color Photography Award, the Eliot Porter Fellowship in New Mexico, and the California Distinguished Artist Award from the National Art Education Association. Nagatani has served as a panelist for the Illinois Art Council, Southern Arts Federation, Massachusetts Council on the Arts and Humanities, Mid-Atlantic Arts Foundation, California Arts Council, and the National Endowment for the Arts. He is an honored recipient of the "Governor's Award for Excellence in the Arts” from Governor Bill Richardson in New Mexico as well as the Honored Educator Award from the Society of Photographic Education in 2008. Nagatani has given numerous public lectures, seminars and workshops and his work has been exhibited widely both nationally and internationally. David Hyams is a photographic artist who specializes in historical and antique photographic processes. Hyams first joined the Santa Fe Photographic Workshops in the summer of 2007 as a member of the seasonal staff. He earned his stripes course-assisting for Christopher James, Cig Harvey and Jill Enfield. In 2008, Hyams joined the Bostick & Sullivan crew as Darkroom Manager. In that capacity, he taught and assisted workshops in a variety of historical processes. His personal work is expressed in wet-plate collodion, platinum, and carbon, and is in collections both at home and abroad. Hyams will be pursuing a MFA starting this fall at the Art Institute of Boston.